Author Ray Lubeski served aboard the destroyer USS Harlan R. Dickson (DD-708) from 1955 to 1958. 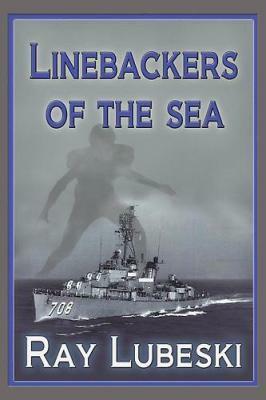 This history entitled Linebackers of the Sea covers American destroyers that fought in WWII and their heroic crewmen, including many who died in battle. The ships covered in this book generally duplicate those included in Robert Sinclair Parkin's 1995 history entitled Blood on the Sea: American Destroyers Lost in World War II. However, Lubeski does not clarify the exact scope of his book, since some destroyers lost in WWII (e.g., Hull (DD-350), Brownson (DD-518)) do not get included, and other destroyers that fought but did not sink (e.g., Hazelwood (DD-531), Murphy (DD-603)) are included. Most of the 75 destroyers and three other ships in this book have a separate chapter that covers each ship's history. The first half of the book has ships that saw action in the Atlantic, and the last half tells stories of ships in the Pacific. The author writes that he obtained most destroyer histories from Wikipedia with supplements for some ships based on interviews of survivors or their relatives. These firsthand accounts greatly enhance the histories, but only about a third of the destroyers included in the book have personal stories, and a few of these are quite short such as the following one from a survivor of USS Pringle (DD-477), which sank after being hit by a kamikaze aircraft carrying a bomb on April 16, 1945 (p. 151). I had a very short conversation with Bill Herman, one of the survivors of the USS Pringle. Bill was a Yeoman First Class on board. He said all he could remember of that day was GQ (General Quarters) went off when the Kamikazes came flying over. He quickly got to his GQ station which was a 5" gun mount located on the stern. Bill was a loader and kept on loading until the guns stopped working. They got the call to abandon ship and he jumped into the water and was there for three hours before the Hobson picked them up. That's all Bill remembered. The volunteers for the Kamikaze Corps were all young and inexperienced pilots. They were given seven days of indoctrination that included building willingness for suicide missions by instilling aggressive spirit. Their first two days were spent on take off practice, and take off and formation assembly. Two days of formation flying. And the final three days were devoted to a suicide manual that had been prepared, and practice in approaching enemy targets. Although young and relatively inexperienced in battle, most kamikaze pilots had joined the Navy or Army well over a year before their suicide missions and had received several months of flight training, although toward the end of the war fuel shortages curtailed training flights. Lubeski's history, Linebackers of the Sea, contains many typographical errors such as incorrect capitalization, wrong spacing, misspelling, inaccurate numbers, and missing letters, which detract from the ship histories. Although personal accounts provide high points such as the story of Bob Jones, who survived a kamikaze attack that sank his ship William D. Porter (DD-579), these stories from survivors are relatively few, and some lack details. For those interested in the history of WWII destroyers, the quality of Parkin's book Blood on the Sea, despite its own errors, exceeds this history by Ray Lubeski since it has more thorough research, contains appendixes with reference information about WWII destroyers and their operations, and includes some personal stories in individual destroyer histories.